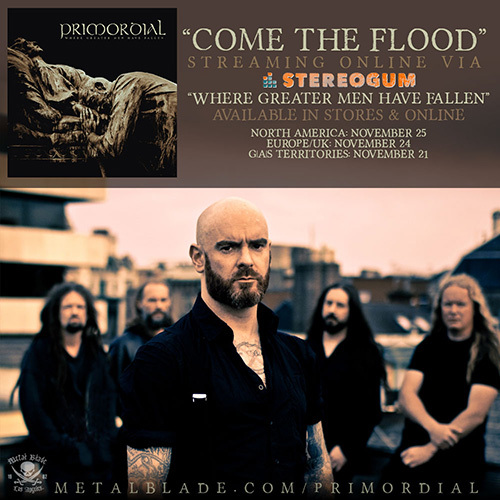 Today Stereogum is pleased to host the official unveiling of “Come The Flood,” the new hymn from Dublin metal troupe, PRIMORDIAL. The stirring tune appears as the third track on the band’s long-anticipated Where Greater Men Have Fallen full-length, set for release via Metal Blade Records this November. Praised by Pitchfork for their fastidiously composed “folk and black metal-inflected classic metal that spirals and extends and, somehow, keeps getting bigger,” Where Greater Men Have Fallen serves as the follow-up to PRIMORDIAL‘s globally adored, 2011-released Redemption At The Puritan’s Hand long player and their eighth studio offering overall. An eight track, fifty-eight minute magnum opus, Where Greater Men Have Fallen was recorded at Grouse Lodge in Dublin with Jaime Gomez (Cathedral, Angelwitch, Grave Miasma) and delivers some of the band’s deepest, most methodically arranged, thematically profound and plainly gripping compositions of their winding catalog of sonic enormity. Experience the near-eight-minute epic “Come The Flood” HERE. Where Greater Men Have Fallen will be released on November 25th, 2014 via Metal Blade Records. Visit http://www.metalblade.com/primordial where you’ll find a lyric video for the title track as well as a gaggle of preorder options. The record will come available on CD and on vinyl in various color variants. Additionally, Where Greater Men Have Fallen will be released in a limited European deluxe edition wood boxset which includes a CD+DVD digibook, an exclusive 7″, a leather wristband, a poster and a certificate of authenticity.